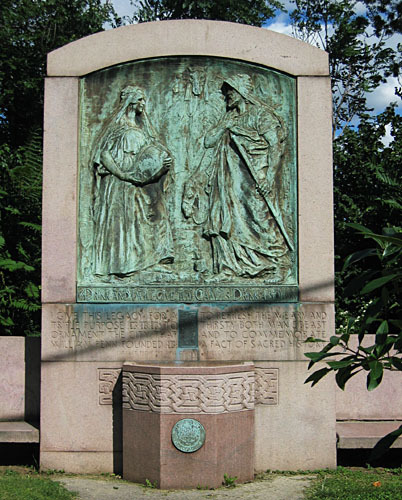 "Rebecca at the Well, 1908, John J. Boyle; Fountain, "to refresh the weary...""
The legend on the bronze: "Drink and I will give thy Camels Drink also." A legacy from Rebecca Darby Smith. On the base: "I give this legacy for a triple purpose. First to ornament the city that William Penn founded. To refresh the weary and thirsty, both man & beast. And to commemorate a fact of sacred history." Now in Fairmount Park, behind the Horticulture Center.